Spanish media paid tribute to Barcelona captain Andres Iniesta after he starred in his side's 5-0 thrashing of Sevilla in the Copa del Rey final at the Wanda Metropolitano stadium. 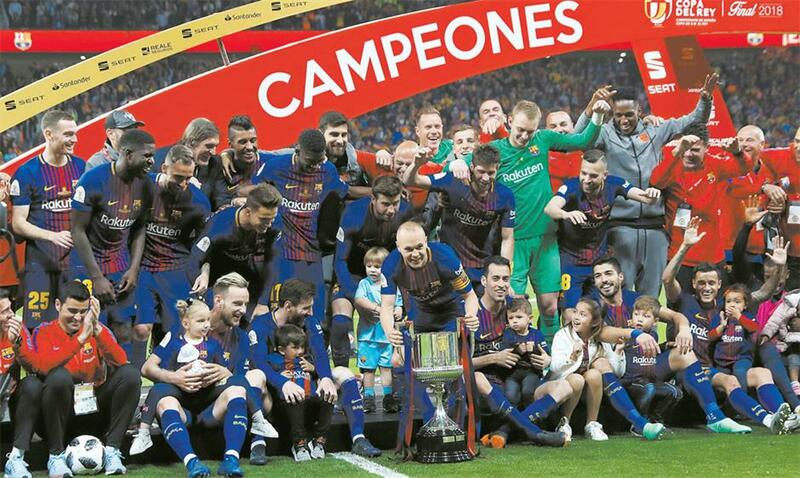 Barcelona players — some with their children — celebrate with the trophy after winning the Copa del Rey final against Sevilla 5-0 at the Wanda Metropolitano stadium in Madrid on Saturday. Captain Andres Iniesta holds the trophy next to his son. SPANISH media paid tribute to Barcelona captain Andres Iniesta after he starred in his side’s 5-0 thrashing of Sevilla in the Copa del Rey final at the Wanda Metropolitano stadium in Madrid on Saturday. Iniesta scored and pulled the strings for Barcelona in a dominant display as the Catalans won the tournament for the fourth season running and a record 30th time. The playmaker confirmed he will make a decision on his future this week and Spanish reports say he will move to a Chinese Super League side. “Iniesta, don’t go!” begged Madrid daily AS on its front page yesterday, while Marca described Iniesta as “the last emperor”, a reference to his potential departure to East Asia. Iniesta, who left the pitch in tears when he was substituted in the 88th minute, was cheered by both sets of fans, who chanted his name. “It was a great night in all senses, on a team and personal level,” he said afterwards. Iniesta’s 2010 World Cup triumph with Spain made him loved across the country and with Barcelona he has won six Copas del Rey, four UEFA Champions League trophies and eight La Liga titles, which will become nine if his side earns three more points from its last five games in Spain’s top flight. The Barcelona media were just as effusive in their praise for the 33-year-old, who joined the Blaugrana as an 12 year old and has played at the Nou Camp for his entire career. Further tributes to Iniesta poured in from his teammates and coach Ernesto Valverde after the game. Meanwhile, Barcelona president Josep Bartomeu hinted there was a chance the veteran could stay. “I know he has offers but Barca is the team of his life, he arrived at 12 years old, he’s given everything and has an indefinite contract,” said Bartomeu.